They were instructed according to their rules of engagement not to intervene, not to come to the rescue of the people inside the Bataclan nightclub or those in the street in front of the Bataclan. 89 people were killed, more than 100 wounded. 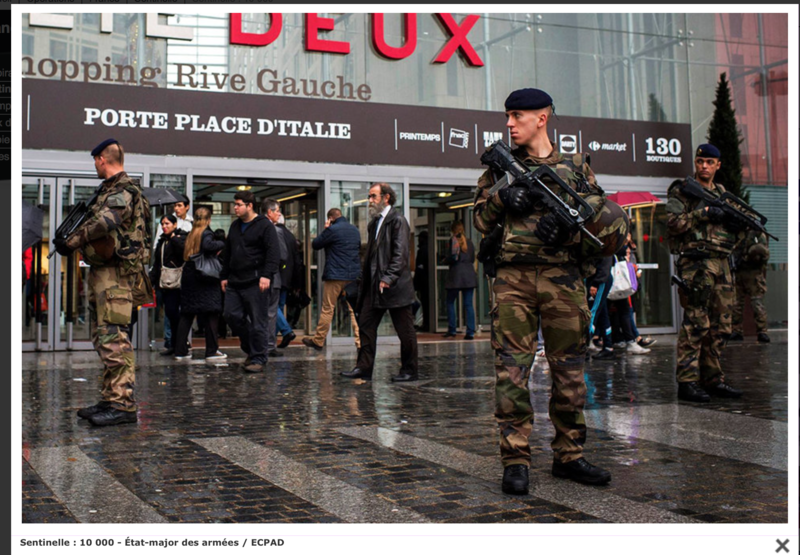 According to a Belgian news report (July 5), The night of the attack at the Paris Bataclan, November 13, 2015, six French military personnel of the Sentinelle Project (launched by France’s Ministry of Defense) were at the entry of the concert hall. An early report by Nouvel Obs (May 6, 2016), confirmed that there were 8 military personnel. They outnumbered the four alleged terrorists inside the Bataclan. If they had intervened, this would have saved lives. It is unclear from the report as to time at which they were stationed in front the nightclub. Military personnel invariably obey orders from higher up. The question is: Who instructed them not to come to the rescue of people inside the nightclub? Was it the Police or the Ministry of Defense? According to Nouvel Ops: The military of the Sentinelle force did not have the green light to use their weapons. 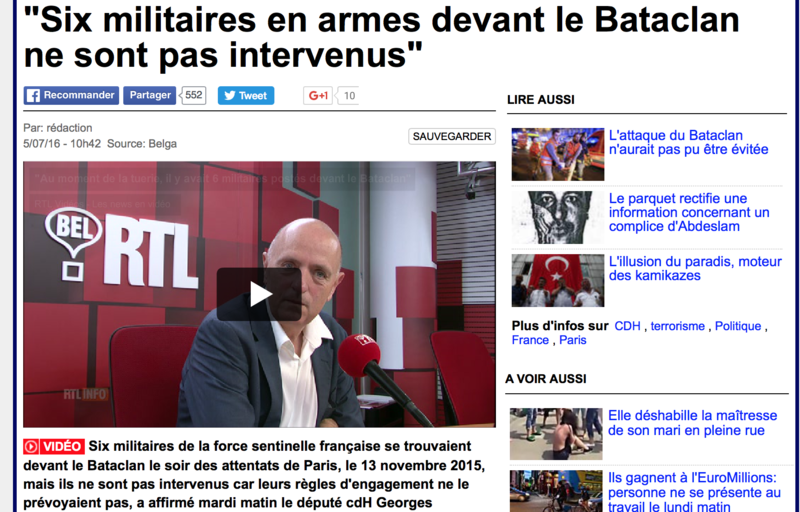 ”The victims will be rescued later, without the support of the Army” (translated from French). It is worth noting that the 4 alleged terrorists were known to the police. It was also confirmed that there was foreknowledge of the November 13, 2015 attacks. “We know that the [French] gendarmerie did not intervene when they were on location,” said the MP.”We know that six armed soldiers who were in front of the Bataclan did not intervene when the massacre at the Bataclan occurred. [original French]: “l’opération Sentinelle vise à protéger les Français et sécuriser, en appui des FSI, les sites les plus sensibles à Paris et en province. The reports suggest that only a specific and select group of police were allowed to enter the nightclub. Why?? There were 10,000 Sentinelle forces in France. They operate under the auspices of the Ministry of Defense. The “Rules of engagement” defined by the Ministry of Defense for the Sentinelle Forces on November 13 were clearly defined. They were mobilized and deployed throughout the country as part of a counterterrorism operation. Their mandate was to protect the French people against the alleged terrorists. Aujourd’hui, la force Sentinelle est constituée de 10 000 soldats – dont 6 500 en Ile-de-France et 3 500 en province. Au total, 50 unités de l’armée de terre ont été mises à contribution pourparticiper à cet effort. Retour sur cette montée en puissance. Dans la nuit du 13 novembre 2015, l’armée a immédiatement renforcé les dispositif sécuritaires des forces de sécurité intérieure (FSI) sur les sites frappés par les attentats terroristes. Dans les 48 heures qui ont suivis les attentats, 1000 hommes sont venus renforcer le dispositif Sentinelle d’Ile de France. Puis en 72 heures, 2000 hommes supplémentaires portent les effectifs déployés en France à 10 000 hommes. En région parisienne, l’arrivée de ces renforts porte à 150 le nombre d’unités militaires déployées. Elles sécurisent plus de 350 lieux – en appui des FSI. En province, la vigilance reste maintenue et le 20 novembre, 500 hommes ont renforcé les 3 000 soldats déjà Lancée à la suite des attentats survenus à Paris les 7, 8 et 9 janvier 2015, l’opération Sentinelle vise à protéger les Français et sécuriser, en appui des FSI, les sites les plus sensibles à Paris et en province.